I am reaching out to you all in an effort to potentially save my wife, Rachel Carter, from becoming completely disabled. A stem cell transplant is her best hope for a long and healthy future and we need your help to make this happen. Rachel was diagnosed with Multiple Sclerosis (MS) when she was 24. For a long time, she lived a very active non-complicated life with MS only in the background. She was able to ignore her disability; in fact, she ran several marathons. Now, she is struggling to use her hands, often needs help to walk, is extremely fatigued and feels severe pain every day. She is going to have a stem cell transplant intended to reboot her immune system so that she no longer has MS. Though this is still in the final stages of clinical trials, there has been tremendous success and no mortality. 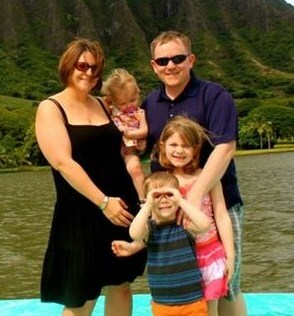 Rachel is an amazing mother to our three children (pictured with us above). Marin is eight, Noah is five and Hannah is just three. Getting this transplant will allow her to carry the kids upstairs when they are hurt or tired, play with them, do their hair, fix their toys, and make them a healthy dinner. Without the debilitating effects of MS, Rachel will be able to once again be the hands-on, active Mom she was before. Stem cell transplants can be life-changing but very expensive. Our family is facing high hospital and doctorsâ€™ bills as well as travel and relocation costs to Florence, Italy. To help with this financial burden, a fundraising campaign in Rachelâ€™s honor has been established with HelpHOPELive, a nonprofit organization that has been assisting the transplant community for 30 years. All donations are tax-deductible, are held by HelpHOPELive in the Northwest Stem Cell Transplant Fund, and are administered by HelpHOPELive for transplant-related expenses only. Your contribution is greatly appreciated. If this has moved you to contribute anything, I want you to know that I am extremely grateful. Thank you for your gifts, prayers, and generosity. A miracle has happened and Rachel is now undergoing transplant in Seattle!!!! Happy New Year, Friends! We’re making tremendous progress and appreciate everyone’s positive thoughts, prayers and gifts. Please share this page with your friends, co-workers and family for a great way to give to a great cause! Greetings Everyone, we received the final denial from United Healthcare on Friday, December 6 for treatment in the United States. Rachel is now tentatively scheduled for treatment in Florence, Italy at the end of February. Thank you for your continued prayers and generosity. Please consider donating and sharing this page across social media. A Tax Benefit for You, A Health Benefit for Rachel. As the holidays are almost upon us, please consider a tax-deductible end of year contribution to HelpHOPELive in honor of Rachel to help with medical bills. We are now at $1100! Thank you for continued prayers and generosity. Good news! Rachel was accepted into the Moscow transplant and this has allowed us to reduce our fundraising goal to $120,000.00! We have so far raised $975. Thank you for your continue thoughts and prayers. Josh I hope the very best for Rachel. I did a little reading up on it and it looks promising. Just know that you have many friends who are wishing, praying,and positive thinking positive thoughts for you. If you think it would help I could also send the kitchen sink, we need a new one anyway. Through it all don't give up laughter. Laughter can make difficult days easier and it is better for healing. I have seen it. A great big hug for all of you. Rachel, Josh & family - My thoughts and prayers are forever with you on this difficult journey. I hope you get your miracle. If there is anything I can do, please let me know. Rachel, I have never met you, yet know your husband from high school. I have always considered him a good person, and I pray for your well being and the strength of you and your beautiful family to get through this! Gods blessings, and we will be doing what we can to help. Hello Rachel - I used to work with Josh and our family wishes you a speedy recovery. We will keep you in our prayers. Nate & Patty Oliver.